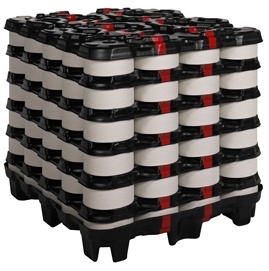 Capable of delivering hundreds of trips without replacement, our plastic pallets set the standard for high quality structural integrity, and that’s why they perform so flawlessly. The pallets and separators feature a grid pattern molded into their structure to cradle dozens of different configurations of tubes and cones of yarn. After they’re emptied, our plastic pallets nest smoothly to save space on their return shipments. Ergonomic and lightweight, our plastic pallets deliver your quality spun yarn without a snag. Shuert sets the standard for high quality structural integrity. We back their plastic pallet lines because they perform flawlessly. Conitex Sonoco is an authorized distributor of Shuert Plastic Yarn-Pak. These pallets are capable of delivering hundreds of trips without replacement. Not only does the molded design keep the yarn more secure and easier to handle, the pallets are stackable for greater space efficiencies during shipping. Furthermore, after they’re emptied, these pallets nest smoothly to save space on their return shipments. Closed loop shipping products depend on the integrity of their design and their materials. Our plastic yarn pallets set the standard for high quality structural integrity, and that’s why they perform so flawlessly. 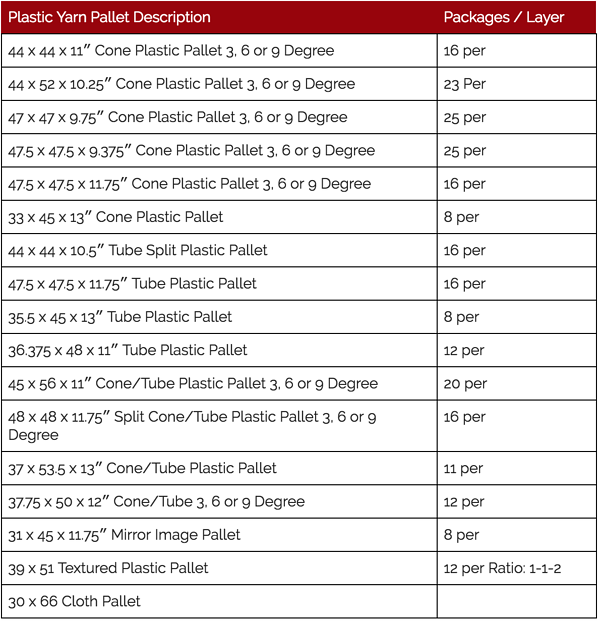 Reach out to one of our customer service representatives with your plastic pallet needs, and we will give you a personalized quote. This six-page brochure describes all the customization options, design features and benefits of our LoadRunner® Corrugated Pallets. Paper Pallet Facts: Are They Strong Enough? We get this question a lot - so we wrote an article with all the facts you need to assess whether a corrugated paper pallet can support your products.